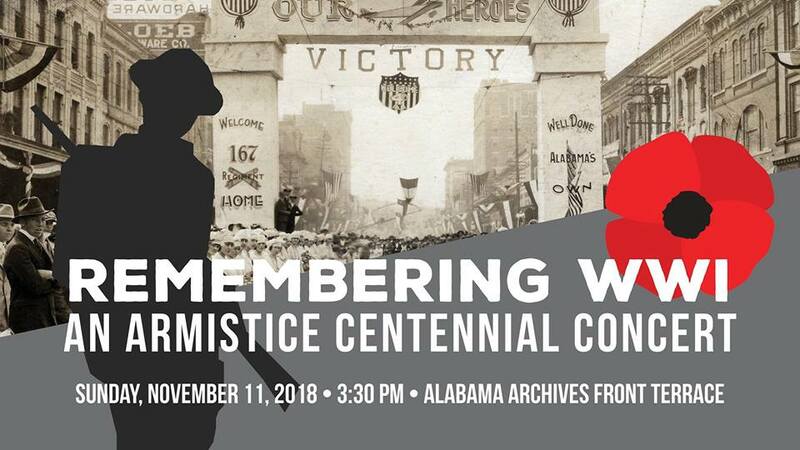 On Sunday, November 11, 2018, at 3:30 pm, the Alabama Department of Archives and History (ADAH) will host Remembering World War I: An Armistice Centennial Concert on its front terrace. This special event, held on the 100th anniversary of the end of World War I, will feature a performance by the 151st Army Band of the Alabama National Guard along with dramatic readings by the Alabama Shakespeare Festival’s Greta Lambert and Rodney Clark. The band will perform musical selections from the World War I era. The readings by Lambert and Clark are excerpted from historical letters, poems, and other materials from the Archives’ collections. “This event will provide an opportunity to commemorate and remember the service of Alabamians in a unique way. As the sun sets at the end of the concert, we hope the audience will leave with a renewed sense of the sacrifices made a century ago,” said Steve Murray, ADAH Director. In 1940, the ADAH building was dedicated as the state’s World War I Memorial. Admission to the event is free. Seating will be provided, but attendees are welcome to bring their own folding chairs. In the case of inclement weather, the event will be moved inside the ADAH.